NASA has ordered up an additional next-generation communications spacecraft, valued at $289 million, for its orbiting network of Tracking and Data Relay Satellites. The TDRS-M bird will be built by The Boeing Company in El Segundo, California. The aerospace giant is working to produce the TDRS-K satellite for launch late next year and TDRS-L in 2013 atop Atlas 5 boosters from Cape Canaveral, Florida. Boeing also manufacturing the fleet's previous generation -- TDRS-H, -I and -J -- that were carried to orbit between 2000 and 2002 atop Atlas 2 rockets from the Cape Canaveral. NASA touts this latest deal as allowing Boeing Satellite Systems to retain at least 300 jobs on the TDRS program. 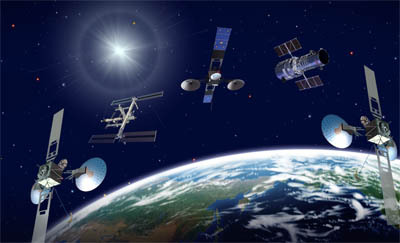 "TDRS-M will address the growing need for satellites to serve as NASA's means of continuous, high-data-rate communication with the International Space Station, Hubble Space Telescope and dozens of unmanned scientific satellites in low Earth orbit," said Craig Cooning, vice president and general manager of Boeing Space & Intelligence Systems. The original contract for TDRS-K and -L was awarded in December 2007 as a fixed-price incentive contract that directed Boeing to design, develop, fabricate, integrate, test, ship, provide launch support, conduct in-orbit checkout operations and provide sustaining engineering support for two spacecraft. The contract also included options for two additional spacecraft, which the space agency has now exercised for TDRS-M.
"With the first-generation TDRS spacecraft retiring by 2015, NASA must continue to replenish the fleet," said Pete Vrotsos, network services director for Space Communications and Navigation at NASA Headquarters in Washington. "TDRS-M is the agency's first step in assuring the space network will meet NASA's and the U.S. government's relay satellite requirements by 2017." NASA launched its first TDRS satellite from the shuttle Challenger in April 1983. The constellation's initial deployment used the space shuttles through 1995 with satellites built by TRW. The three subsequent birds went up on the unmanned Atlas launchers. The TDRS-K is poised for final assembly and entering factory testing that will subject the satellite to the harsh conditions it will experience in space. "I am excited to see the TDRS-K satellite enter the thermal vacuum chamber and begin environmental testing," said TDRS Project Manager Jeff Gramling said recently. "Successful completion of the environmental testing phase of the project will be the last step before we ship the TDRS-K spacecraft to the launch site," said Dave Littmann, TDRS deputy project manager. "Through a rigorous testing program, we will ensure this satellite, once on-orbit, is capable of meeting its functional and performance requirements, to provide reliable services to the customers of NASA's Space Network." The TDRS system provides two-way communications between Earth and spacecraft such as the Hubble Space Telescope and the International Space Station. They are positioned around the globe in geosynchronous orbits 22,300 miles above the planet.